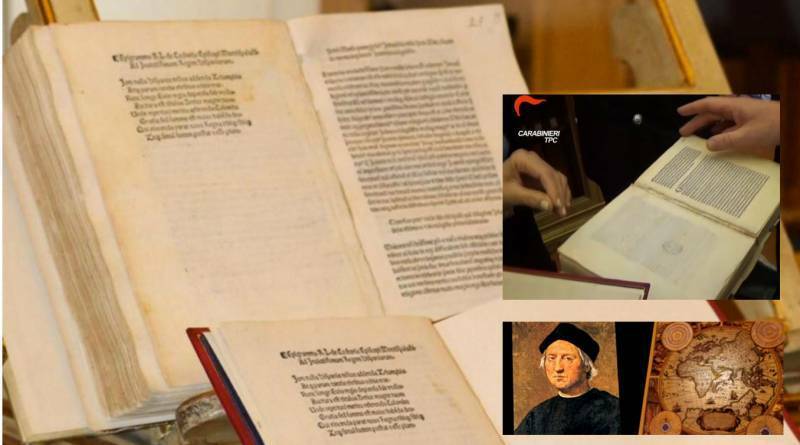 ROME -- Thanks to remarkable cooperation between investigators in Italy and the United States, a stolen copy of a letter Christopher Columbus wrote in 1493 describing his discovery of America was returned from the United States to Italy on May 18. Restitution of the extremely rare letter, stolen from a Florence library, was made at a ceremony in Rome attended by Culture Minister Dario Franceschini, U.S Ambassador John Phillips, and General B. Marino Mossa, head of Italy's paramilitary art squad, the Carabinieri per la Tutela del Patrimonio Culturale. After Columbus's return from his 1492 voyage, he wrote to the King and Queen of Spain, Ferdinand and Isabella, describing his impressions of both the landscape and the native dwellers he had encountered in the New World. "Interestingly, this letter, written 500 years ago, has now made the same trip to and from America," said Minister Franceschini. After Columbus wrote it the letter was translated into Latin, and no more than 24 copies (and perhaps only a dozen) were printed and circulated in the next eight years. This, printed in Rome by Stephan Plannck in 1493, was one of the earliest copies. Proof that it came from the Riccardiana was on the page: the library's stamp, carefully deleted, but visible in modern scanning technology. The investigation into the theft continues, but officials at the restitution ceremony said that the copy may have been replaced with a fake as long ago as 1950, when the letter was put on loan for an exhibition in Rome. In 1990 a Swiss collector apparently sold the letter to an American buyer, who resold it. Following a further sale at an auction for $400,000, it ended up in 2004 in the Library of Congress as a donation. However, in 2012 the director of the national library in Rome, the Biblioteca Nazionale, told Carabinieri police of the theft from their archives of several valuable books. Working with the Italian police, investigators from the U.S. Department of Homeland Security were tipped off that one of the rare Latin copies had been removed from the Biblioteca Riccardiana archives in Florence and replaced with a forgery. The Homeland Security investigators informed the Italian Carabinieri art squad, and a joint investigation was launched. Today thieves can replace the originals with high-res photographed copy printed on antique paper. The Italian inquiry (and there is almost surely more than one cleverly made forgery) has been coordinated by Rome prosecutor Tiziana Cugini. In the U.S. Prof. Paul Needham of Princeton University's Department of Ancient Books and Manuscripts contributed to the investigation.